Email Verifier Pro is an online service, there is nothing to install or software to download. 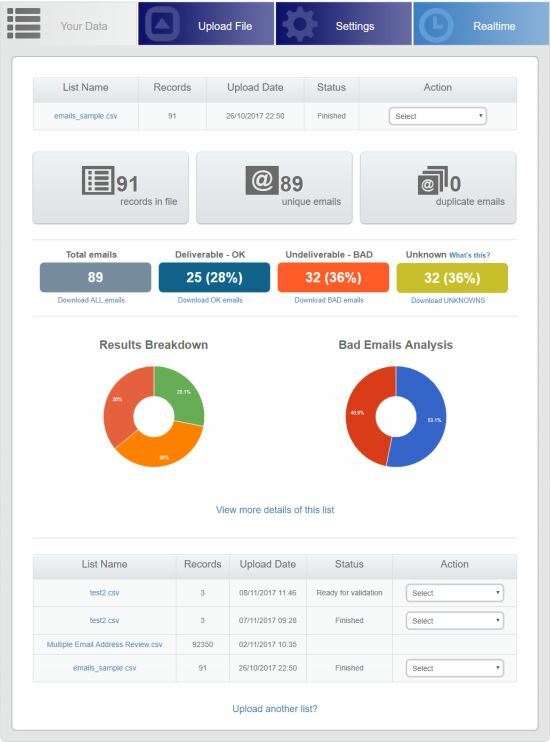 Remove dead emails, invalid syntax, and fake emails from your subscriber or other email lists. Performs a pre-validation “clean-up” to remove known bad domains and invalid syntax before submitting to validation. Syntax Checking – The overall syntax of the email address is checked to see if its correct, eg. Does it contain an @ sign or invalid character. Domain Checking – The domain is checked to see if it exists, and if so si it configured to accept email? Mailbox Checking – The actual mailbox is checked against the ISP to see if it exists or not. Your lists are stored for up to 60 days, with the original filename preserved. Remove Your Bounces Today! Start for FREE! The WinPure Email Checker credit based system allows you to purchase a block of email cleaning credits that relate to your immediate email verification needs. No matter what size email list you need to clean and verify, WinPure Email Verification offers a simple pay as you go pricing plan to meet your requirements. Did you know that 66% of organizations say that email will be their most important communication channel in 2018? Or that 53% of organizations believe they have a high email bounce rate? Benefits of Email Verification. You can start today by registering for a free account. This allows you to access the Online Email Cleansing Service and begin uploading your data, returning whenever you wish and at your convenience. You can upload your email lists and almost immediately see an overview of each, including the number of duplicate records, those with an invalid format, common typing errors, generic mailboxes and more. Once you have uploaded your email lists and had chance to review the initial analysis of the lists, you can then choose to purchase a suitable packages so to allow you to download the cleansed lists. Following payment, the system then automatically begins the final cleansing process. Once processed, separate or combined lists can then be downloaded for each of the status types (Good, Bad or Unknown). We verify the best in the business!